Good things - Gibson & team take Gold! Sometimes all the hard work does pay off. 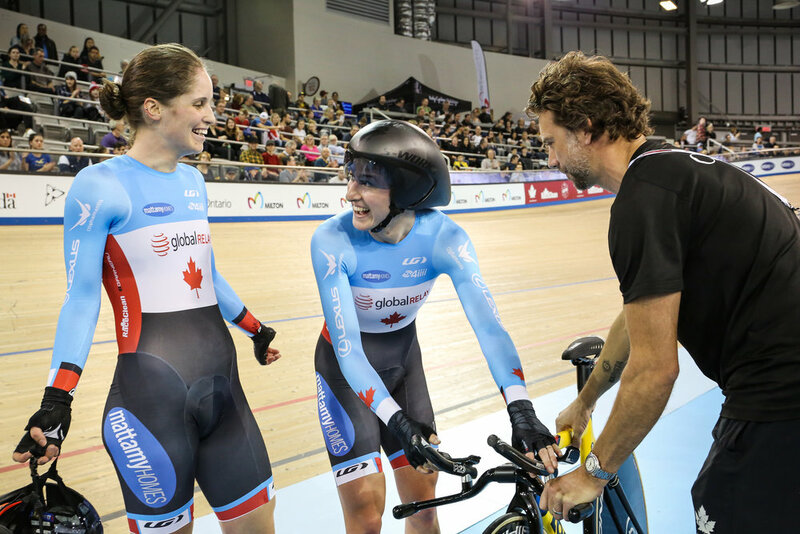 The Canadian Women's Endurance Team put on quite a show in Milton, and in dramatic fashion, won GOLD in the Team Pursuit (TP). The event is comprised of three races: a qualifier to rank the teams; round 1 to determine which teams will race for gold & silver, and which teams will race for bronze; and then the Gold and Bronze FINALS. Juventus' Kinley Gibson got the nod for the P1 (starter) position for the qualifier. 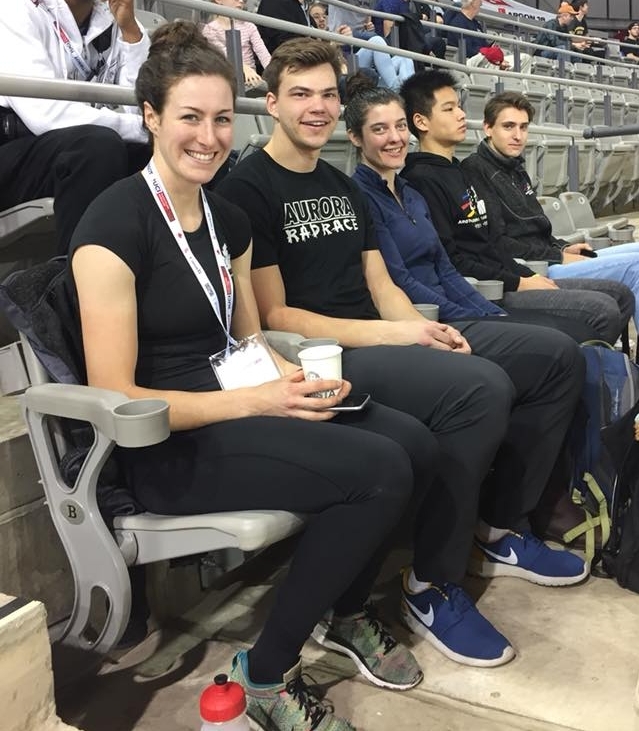 She would be teamed with the same quartet that won Silver at the first World Cup of the season in Pruszkow in early November: Allison Beveridge, Ariane Bonhomme, and Annie Foreman-Mackey. The group did not disappoint, turning in a best time. In Round 1, against 4th place qualifier Japan, coach Craig Griffin switched things up, putting in Steph Roorda as P1 (Allison was also racing the Omnium), Kinley as P2, and adding Kirsti Lay to rest Ariane. The team easily qualified for the Gold Medal Final. New Zealand is very competitive in TP, and Canada knew they needed to perform! The team returned to their original line up, and got ready to race. The stands were packed, and the crowd was ravenous for a victory. The countdown ended, and the two teams blasted from the line. The Canadians felt the thundering power of home advantage. They lost all ability to communicate with each other: as they rode faster and faster, the crowd cheered louder and louder. They were propelled forward, and were able to catch New Zealand with more than a lap still in the race. GOLD!!! - and the first World Cup Gold Medal on Canadian soil since 1998.
in the GOLD Medal Final!! UCI World Cup III was live-streamed around the world. The cheering crowd was so loud . . . spurring the team forward, but preventing all communication in the line! Craig Griffin urges the women onward! 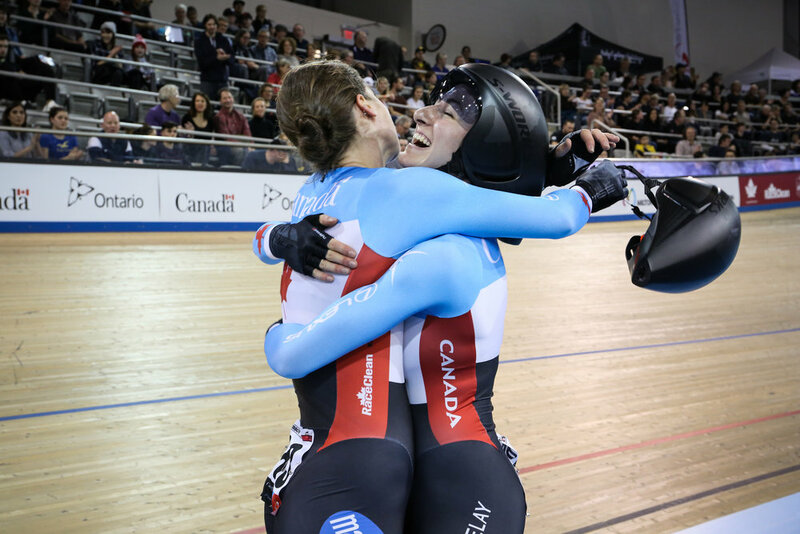 You can see the joy of a rewarding effort beam from these Canadian women! There will be a bit of savouring the victory, a lot of thanking of the supporters behind the success, and then it's back to work . . . because the target is the 2018 world championships in Apeldoorn, Netherlands at the start of March. after the podium in Milton. She is unable to stop beaming! Day 3 of the World Cup, and it's Kinley's turn to cheer. Alex Ongaro, in Milton to observe top performers, took this picture of Mikael and Zac, who joined Meika and Stefan for the excitement. Congratulations to Kinley on representing Juventus, and Canada so well!